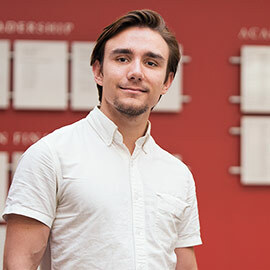 The Laurier Centre for Economic Research and Policy Analysis (LCERPA) has awarded Laurier Business and Economics student Dylan Clarke the 2015/16 Peter Sinclair Undergraduate Research Prize for his work on credit constraints and exporting within in Vietnam. Eight nominees presented their research at a symposium hosted by Laurier’s Department of Economics. This is the second year LCERPA has run the symposium, which was established to recognize demonstrated excellence in research ability among Laurier's undergraduate students. LCERPA offers Laurier's undergraduate economics students opportunities to develop and promote their research skills. This is the first year that LCERPA has awarded the Peter Sinclair Undergraduate Research Prize, announced in 2016 in honour of the late Peter Sinclair, an associate professor of Economics who passed away in 2015. The runner up, Steven Whitlow, was commended for his research on the effect of immigration on wages in the United Kingdom. Clarke, who worked under the supervision of Associate Economics Professor Brian McCaig as part of a fourth year advanced special topics in economics course, looks at how poor institutional frameworks, in particular weak credit institutions within Vietnam, may prevent the most productive firms from entering the export market, creating inefficient allocation of resources in response to trade liberalization. Clarke graduated from Laurier’s Business Administration program in Spring 2016. His research examines whether privately owned firms are denied export opportunities during periods of liberalization due to the misallocation of credit in favour of highly inefficient state-owned enterprises, rather than allocating credit toward ostensibly more productive private firms. This fall, Clarke will attend the University of Toronto as a master’s student in economics. Together, he and McCaig are working to finalize the research paper on Vietnam for submission to an academic journal. The paper will also be presented this September at the Rimini Conference in Economics and Finance.